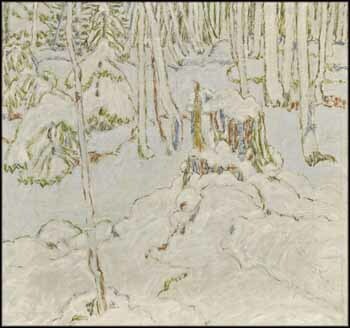 signed and dated April 20, 1921 and on verso titled, dated by Douglas Duncan and inscribed "Col Mrs. Phillip Clark (Paraskeva Clark / 0 - 24)"
David Milne spent the winter of 1920 until May of 1921 painting in a cabin he built in a secluded valley on the flank of Alander Mountain, in the Lower Berkshires, five miles from Boston Corners. Milne's letter of April 21, 1921, to his friend James Clarke, in which he directly refers to this work, offers a fascinating insight into his creative process. Milne wrote: "Still snowing. The little hemlocks were beginning to show the weight of the snow, only the smaller twigs bending. Toward night the larger branches started to curve downward and by dark the tips were drooping. Tuesday morning made the last snow sketch, a 14 x 16 oil...Before I had the drawing finished the rising temperature had released the hemlocks, and when the sketch, started with everything white, was finished there were just one or two little spots of white round the red stump...One of the best sketches." From this description we can recreate in our imagination the stillness of the scene and the striking impression of the woods softly blanketed in snow that was the source for this beautiful canvas.